At a recent gathering of budding companies, we met the owner of these vertical gardens. Needing only 20″ diameter for the pot itself (your plant needs may differ) they can stack up to 62″ high, and grow everything from basil to carrots to lavender. It uses a hydroponic system to water and nourish the plants. A base mounted on ball bearings allows it to turn readily for even light. We would imagine that our testers would pretty much decimate the lower level. Entomologist JohnnyFedora demonstrated the biting, rash, and blistering from bed bugs by giving himself a rabbit-shaped tattoo. We are in the throes of revising this website so it appears on all sorts of devices, from your desktop while working to your cell phone while driving. Tilbert chewing fresh fennel will no longer be our featured bunny at the top of the page, especially since so many others have joined the warren. The myth of the rabbit making mochi on the moon is a favorite one in Japan, and seems to be as pervasive as the Easter Rabbit dying eggs story. It shows up in culture as toys, art, cartoons, religious art, and pop art. I have created a gallery of images I have collected over the years. And you can see more pictures of the bunny, mochi, and moon quilt made for my niece here as well as find sources for fabrics. Last Autumn, we attended a little lecture on the Japanese tea ceremony and the Four Seasonal Icons of Japanese autumn culture – “Mangetsu (full moon), Oborozuki (moon obscured by clouds), Susuki (autumn grass), and of course, Usagi (rabbits). We learned why rabbits and autumn grass are paired and why the moon hides behind clouds in so many images of autumn, just as we Westerners will depict Autumn with dried corn, falling leaves, a pumpkin, or turkey. At the tea ceremony, we were even given a sweet shaped like a rabbit. Long blog short, the grass produces the seed heads at about the same time as the full moon, clouds are common at the time but also serve as a means of enhancing the fullness and brightness of the moon. The rabbit, meanwhile, is seen on the moon itself in many cultures, including Asian, indigenous Latin American, and native Pacific Northwest tribes. In Japanese culture, the rabbit pounds rice into mochi. The Japanese celebrate this full autumn moon much as we have Harvest Moon parties. Not surprisingly, the festival tend to be hundreds of years old and much more zen. Tsukimi or Otsukimi, literally moon-viewing, refers to Japanese festivals honoring the autumn moon. The celebration of the full moon typically takes place on the 15th day of the eighth month of the traditional Japanese lunisolar calendar; the waxing moon is celebrated on the 13th day of the ninth month. These days normally fall in September and October of the modern solar calendar. Tsukimi traditions include displaying decorations made from Japanese pampas grass (susuki) and eating rice dumplings called Tsukimi dango in order to celebrate the beauty of the moon. Seasonal produce are also displayed as offerings to the moon. Sweet potatoes are offered to the full moon, while beans or chestnuts are offered to the waxing moon the following month. The alternate names of the celebrations, Imomeigetsu (literally “potato harvest moon”) and Mamemeigetsu (“bean harvest moon”) or Kurimeigetsu (“chestnut harvest moon”) are derived from these offerings. As International Rabbit Day (4th Saturday of September) falls so close to the same period, we would like to get bunny lovers better acquainted with this fascinating celebration. 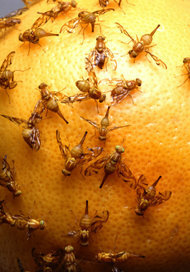 The NY Times featured an article today about the effects of organic produce on fruit flies v conventional produce on fruit flies. When Ria Chhabra, a middle school student near Dallas, heard her parents arguing about the value of organic foods, she was inspired to create a science fair project to try to resolve the debate. 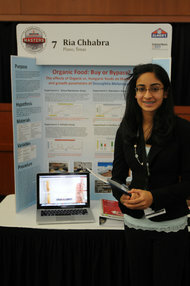 Three years later, Ria’s exploration of fruit flies and organic foods has not only raised some provocative questions about the health benefits of organic eating, it has also earned the 16-year-old top honors in a national science competition, publication in a respected scientific journal and university laboratory privileges normally reserved for graduate students. Courtesy of Ria ChhabraRia Chhabra stands in front of her project. The research, titled “Organically Grown Food Provides Health Benefits toDrosophila melanogaster,” tracked the effects of organic and conventional diets on the health of fruit flies. By nearly every measure, including fertility, stress resistance and longevity, flies that fed on organic bananas and potatoes fared better than those who dined on conventionally raised produce.